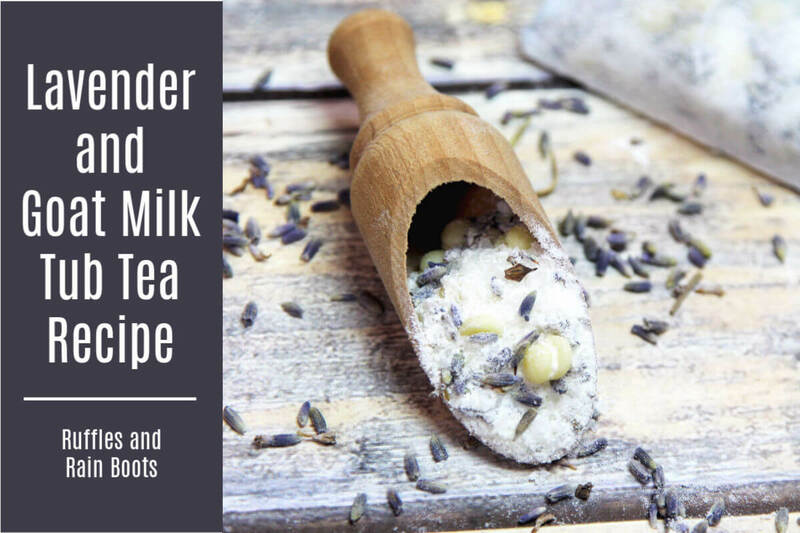 We’re sharing a simple recipe for an amazing lavender goat milk bath tea. There’s nothing quite as relaxing as a scent-filled bath and these will be perfect for a spa day at home for you or as a gift. Click through and get the recipe and tips for amazing tub teas. The aroma of nature’s most relaxing scent, lavender, is beautiful. But let’s be honest: it makes a stinking mess in the tub! I have to clean enough that I really don’t want to get into a zen-like state only to be violently shaken from it while I scrub little flowers from the sides of the bath. Enter the wonderful invention of bath teas. We’re no stranger to creating our own tub tea recipes here on Ruffles and Rain Boots. Because we’ve been making them for years, we have a few tips and tricks we’d love to share with you. I’ve shared some printable gift boxes with this bath tea recipe, but the gifting options are endless. So are the scents! Our favorites scents for DIY bath products are the standby recipes which include a citrus scent, peppermint, green tea, or vanilla. 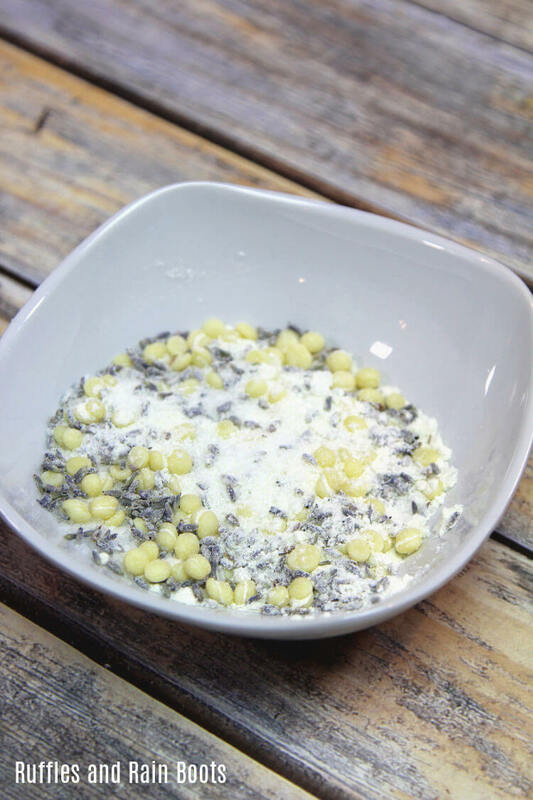 In a small glass or stainless steel mixing bowl, combine all ingredients. Stir well to incorporate the items. Fill an organza bag halfway and tie closed with the drawstring. Double-knot the bag so none of the items can be released in the bath. If you’re using the tea bags, fill two-thirds full and fold down the top of the tea bag. Fold the corners in and then the top down. You can seal it closed with a flat iron or staples. To use these amazing lavender and goat milk bath teas, drop into a warm bath. You can hang the bag over the faucet to ensure the hot water melts the cocoa butter (if using). Your shares are how we grow and we are sincerely grateful. 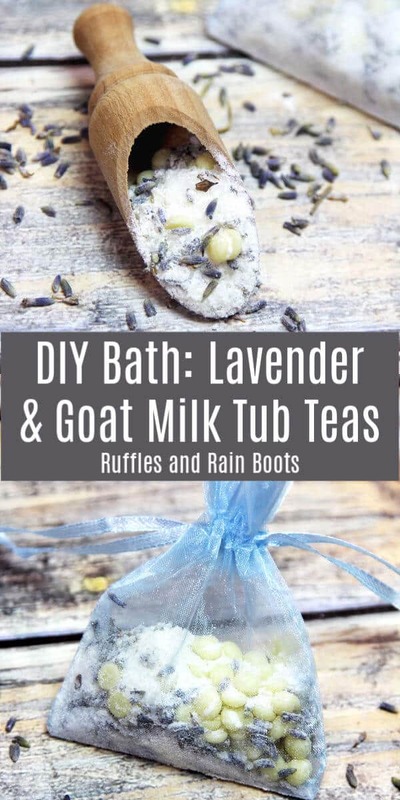 Please share this lavender and goat milk bath tea Facebook or saved to your favorite Pinterest board. While you’re there, be sure to follow Ruffles and Rain Boots on Pinterest.